Zlatan Ibrahimovic Wins Manchester United the EFL Cup. He just keeps on winning! Here at Brainstain, we really are fans of people who do what they say they’re going to do, whether it’s in politics, to music or to football (soccer). Right off the bat, you can think of President Donald J. Trump, who defied all the critics and did it his way, winning the campaign and doing exactly what he said he would do. In music, the late great rapper, Tupac Amaru Shakur did his music with a burning desire, always with excellence and with heart; truly he spoke his mind to the realities of who he was and he had a voice with strong musical content. He was revered and feared by critics, but nothing slowed him down either. In Zlatan Ibrahimovic, the footballing legend, you have something similar, a man who was told he could never reciprocate his form, fetes and winning accomplishments in football and bring it to the English game. He signed with Manchester United this past summer on a Free Transfer. Many critics said that he would never be able to adapt to England after playing in France most recently for PSG. But, we always laughed at all his doubters and now just yesterday, he scores his 26th goal in all competitions in a cup final, with two truly wonderful goals. One was a great curling free-kick into the lower corner of the net from over 35 yards and then followed by a game killing header in the 86th minute, final of the EFL Trophy. We knew that free-kick was going in, we’ve seen him do it so many times in his career. Check the entire highlights here below. Quite amazing! What a player! Never did we ever doubt Zlatan’s influence on Manchester United this season, even though, critics were saying that he was too old at 35 years old to play well enough, which is obviously and should be considered as totally ridiculous by now. He has played more games than any other player in the squad and he’s scored more goals than anyone else in the whole country. Zlatan has always spoken his mind and he has always done what he said he would do. Wherever he has played, he was won trophies. One thing that he always does is keep on winning. You can’t deny that he is a winner. Check out the fun confidence of the man, that’s labelled “God” in Sweden and soon enough even his “God of Manchester” comment to Eric Cantona, looks like it really is coming true. Rule number one, is that you never doubt Zlatan. After lifting the EFL trophy yesterday, that’s his second in Manchester United’s colors, following on from the Charity Shield in August 2016. That’s his 32nd trophy in his career and he’s currently the top goal scorer in all of England. Not bad! Today Zlatan revealed that it was his two children that had helped convince him to sign for Manchester United, along with the phone call from Jose Mourinho, asking him to come and join the revolution and the rejuvenation of Manchester United football club, post Alex Ferguson era. So far, it is going well and with Manchester United still in the Europa League, there’s hope for more silverware for Ibrahimovic and Jose Mourinho this season. Let’s hope so and Zlatan Ibrahimovic is clearly in the running for ‘Player of the Year’ and ‘Players Player of The Year’ in the English Premier League this season. What makes us even more joyous about all of this is due to all the doubters and “naysayers”, the “critics” of Ibrahimovic and the one thing that we absolutely adore is when people do what they said they would actually do, with assured confidence and then back it up with the results. That’s a winner and who doesn’t like a winner? A loser, obviously, a jealous loser. It’s that infectious confidence of assured winning, that cannot be denied and you just have to love that about Zlatan Ibrahimovic, who’s now slowly guiding Manchester United back to success. Mind over matter, there’s that determination, the will and skill, and work ethic to be the best and that’s what usually defines winners. 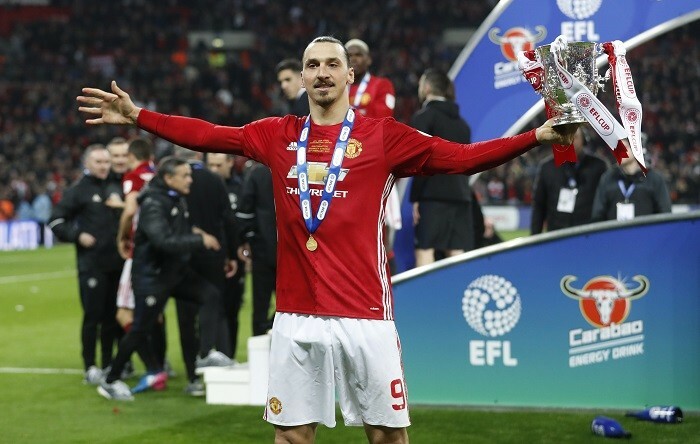 Zlatan is a winner and what a cup final it was! Manchester United now face AFC Bournemouth at home on Saturday in the Premier League, followed up by the Europa League away match, First Leg, against Rostov, in Russia on Thursday the 9th of March. Zlatan is definitely the main Red Devil, leading the line for United! Previous Article← The Reasons Why Millions of People Boycotted The 2017 Oscars. Mistakes in La La Land.